Calling it their independence day, Libyans took to the streets Oct. 20 to cheer the demise of the man who had ruled them for 42 turbulent years. Muammar Gaddafi was reportedly killed when rebel forces finally captured his hometown, Sirt, where the last remnants of the Gaddafi regime had held out amid weeks of grueling, grisly fighting. Gaddafi rose to power in 1969 at age 27 when he led a bloodless coup to overthrow the ruling monarch. He was then appointed commander in chief of the armed forces and chairman of Libya's newly instated governing body, the Revolutionary Command Council. It was then that he began to slowly assume the entirety of power. He started by removing the U.S. and British military bases in 1970. In time he would eliminate the parliament, political parties, unions and nongovernmental organizations. In Gaddafi's quixotic Jamahiriya, or "state of the masses," he neglected to don a real political title, preferring to be known simply as Brother Leader. In reality, Gaddafi allowed only a small group  mostly members of his family  to participate in the governing of the country, which, thanks to its oil reserves (the ninth largest known in the world), had amassed enormous wealth. The riches allowed him to rule relatively unchecked until February 2011, when his people had had enough. Spurred by the Arab Spring that had successfully toppled the governments of Tunisia and Egypt, Libyans took to the streets. Gaddafi lashed back with unprecedented violence against his own people while at the same time telling members of the press, "All my people love me." The resistance kept pushing forward, winning support from NATO forces, which began air strikes on March 19. On Aug. 22, after six months of fighting, the rebel forces claimed the capital city, Tripoli, as their own, formally ending Gaddafi's regime. But until they captured the man himself, Libyans could not breathe a sigh of relief. That moment came Oct. 20, when Prime Minister Mahmoud Jibril told a news conference, "We have been waiting for this moment for a long time. 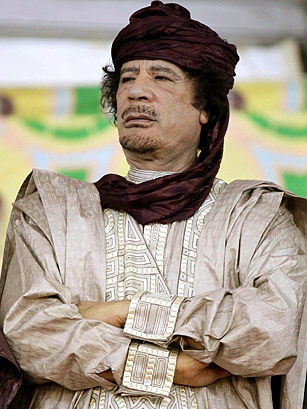 Muammar Gaddafi has been killed." See more on Gaddafi's demise.